The Li Jujube are round shape, small fruits with reddish-brown color skin.Eat fresh when firm, or allow to dry, wrinkle, and become chewy like a date. Jujube is also known as the “Annab” or the “Chinese date”. Harvest in the Fall. Jujube trees are attractive, easy-to-grow, hardy, and drought-tolerant. A practically pest and disease free tree. Jujube trees thrive in long, hot summer climates. Low chilling requirement. Trees are partly self-fruitful or pollinated by Lang. 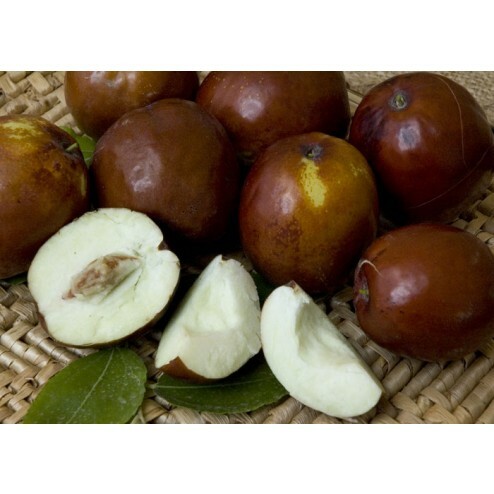 The Li Jujube is also known as Chinese date or Annab, jujubes are very healthy and nutritious. jujubes are small, sweet and delicious fruit white flesh fruit that are round to oval shape. Eat them fresh or enjoy dried. Jujube fruit is green when immature, but turns yellow with spots when ripe. Eat with the thin skin as it contains many nutrients. Considered a superfood, jujubes contain a lot of Vitamin C.
Grow jujube trees at home. They have been cultivated for thousands of years. The tree is deciduous and can grow 10-30 feet tall. The leaves are small, dark green, and bi-pinnately compound, so the tree is drought tolerant. Plant jujube trees in the full sun and water once or twice a week while actively growing in the Spring and Summer. Reduce water in the Fall as the tree drops its leaves. Little to no supplemental water is needed in the winter while the tree is dormant. Branches naturally droop creating a beautiful appearance. Harvest fruit in the Fall. Plant a jujube tree in the full sun. A jujube tree can grow 15 – 20 feet tin height, but easily prune to keep 8 – 15 feet tall. Plant trees as close as 8- 10 feet apart, but allow for more space if you intend the tree to grow wider. Water the jujube tree deep but not too frequent. Plant in good soil that drains well. Create a berm around the drip zone. This ensures the trees have a good watering well around the roots to collect water. Water new trees regularly, about 1-2 times per week during the Spring growth season. Increase the frequency to 2-3 times per week during the hot summer. As the weather cools in the Fall, reduce the frequency of irrigation back down to once per week. Discontinue water during the winter while the tree is dormant. Fertilize the jujube tree in the Spring with a balance organic fruit tree fertilizer with a 1-1-1 or a 2-1-1 NPK ratio, such as (5-5-5)or (6-3-3). Manure can be applied in cool climates. Reapply growth formula fertilizer in the Summer. Do not fertilize in the Fall as this the time the tree has slowed growth. Apply a fertilizer with low nitrogen and high phosphorus and potassium with a 1-2-2 or 1-4-4 NPK ratio such as 4-12-12 analysis. Prune the jujube tree in the winter, while the plant is dormant. Cut the tip to prevent it from becoming too tall and promote side branches from growing. Remove any new growth below the graft, low in the branches towards the center of the trees, and crossing towards the wrong direction. Thin your tree in the summer to remove dry twigs, water sprouts, too many fruits to direct desired growth.